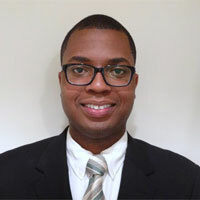 Dr. Tonye “TJ” Jones, a UCLA Urology fourth year resident, recently received the Jerry Janger Memorial Seed Grant from the STOP CANCER Foundation for his research in treatment options for prostate cancer. Dr. Jones is currently working with Dr. Leonard S. Marks, UCLA Urology professor, to investigate focal therapy for the treatment of localized prostate cancer. The research builds on Dr. Marks’ previous work with magnetic resonance imaging/ultrasound (MRI/US) fusion biopsy, which uses MRI to identify and target suspicious areas of the prostate. Dr. Marks recently completed a phase I clinical trial investigating the safety of focal laser ablation (FLA) for prostate cancer within an MRI tube. Additionally, there is an ongoing phase I clinical trial examining the safety and feasibility of FLA within an outpatient clinic setting using MRI/US fusion guidance and local anesthesia. As an extension of this work, a future study will be initiated to investigate the safety of high intensity focused ultrasound as a focal treatment for prostate cancer. The funds received from the STOP Cancer grant will be used to further this research. Dr. Jones will be honored at the STOP CANCER Foundation’s 25th Annual Educational Forum and Research Awards Dinner to be held on Thursday, January 12, 2017 at the UCLA Luskin Conference Center. STOP CANCER grants are given to the most promising scientists at UCLA’s Jonsson, USC Norris and City of Hope Comprehensive Cancer Centers.